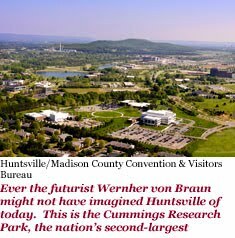 Let me put it in the form of a question: How did Huntsville, Alabama, once a dozy little southern town whose notable claim to fame was its reputation as “The Watercress Capital of the World” morph into a globally renowned “Rocket City” almost overnight? And how did it evolve still further into a wide-ranging technology center whose 180,000 residents bustle among military and space installations; gigantic research parks, including the nation’s second-largest by number of employees; and high-tech plants such as a Toyota facility that builds the only four-cylinder engine made outside Japan? How? 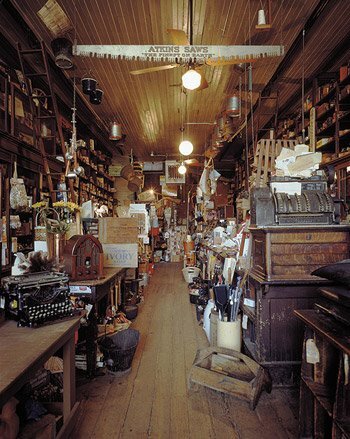 With determination, a little bit of luck, and a sophistication that those who would stereotype the South as stuck in the 19th Century would find surprising. And there are many more surprises. 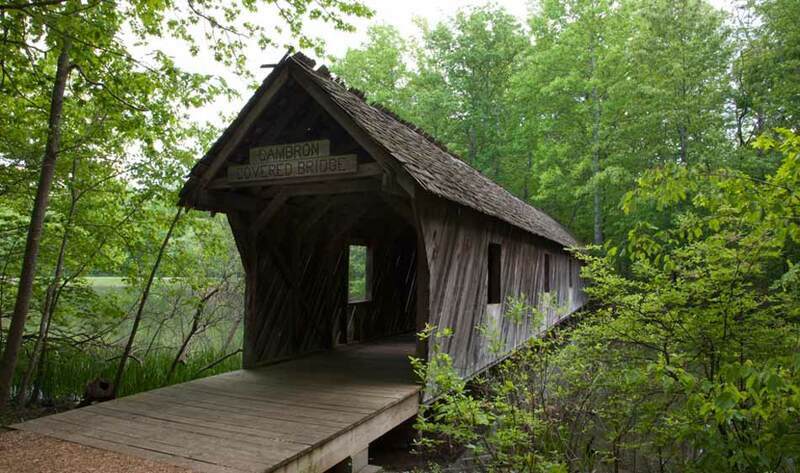 Here’s a second: In the midst of breathtaking demographic and technological changes, Madison County, of which Huntsville is the seat, has managed to remain an agricultural colossus. It ranks first in Alabama in cotton production, second in corn and soybeans, and among the nation’s leading producers of popcorn, of all things. Not much watercress any more, though, even though, 60 years ago, Madison County grew and shipped it all over the nation. 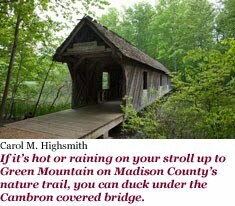 Cotton, not watercress, was King in the South, of course, and Madison County was its throne. 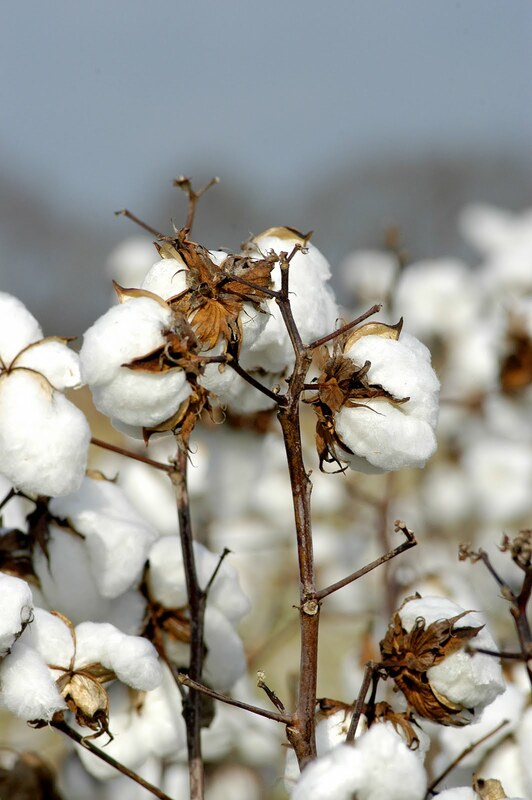 The rich alluvial soil near the Tennessee River, which curls to the south of Huntsville, was ideal for cotton cultivation. 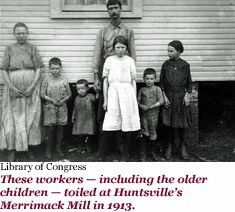 Cotton gins dotted the countryside, brokers sampled the crop along “Cotton Row” across from the courthouse, and, eventually, thousands of workers ─ including children by the hundreds before child-labor laws and compulsory school attendance put an end to it ─ toiled at 12 textile mill “villages,” as they were called, making cloth and thread. Then came World War II and Surprise No. 3 for anyone tempted to cast Huntsville in a sultry southern tableau of white-columned antebellum mansions, fragrant magnolia blossoms, and fancy cotillion balls. Only the sultry part of that image really fits this city at the base of the Cumberland Plateau. Huntsville is hot as the dickens from June through September, for which the cotton farmers are grateful. But spring and fall are delightful, and winter even brings an occasional snowstorm. Huntsvillians get a taste of all four seasons, in other words. In that regard, and in another of much greater significance, Huntsville is a lot like Washington, D.C. Washington, a couple hours’ drive north of a former Confederate capital —Richmond, Virginia — is a “federal city,” separate from any state. Three in 10 jobs in the nation’s capital are federal ones ─ not even counting the hundreds of thousands of government-dependent and contracting jobs there and in the adjacent suburbs. Huntsville — two hours north of another former Confederate capital in Montgomery — is what Alabamans, with some derision and a hefty dose of envy, call “the federal outpost.” According to several folks I met, the Alabama Legislature in Montgomery assumes that Huntsville and Madison County are rolling in federal dollars and don’t need as much state money for roads and schools as they’d normally get. Why, grumble the folks farther south, Madison County even has its own electric utility company that gets (relatively) cheap power from dams built by the federal Tennessee Valley Authority on the Tennessee River in the 1930s. Still, there’s no denying that the Huntsville metro area accounts for almost half of the net new jobs created in Alabama since 2000. 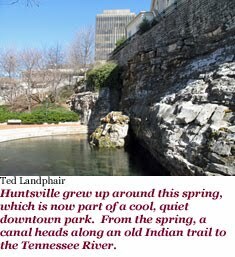 Those who remember cotton-town Huntsville, population 13,000, in 1941 still can hardly believe the transformation. That’s the year, with war raging in Europe and imminent at home, that the U.S. Army picked 15,000 hectares (38,000 acres) of river-bottom land outside Huntsville for a huge chemical-warfare manufacturing and storage facility and, soon, a munitions operation producing bullets, artillery shells, and “burster” explosive charges. 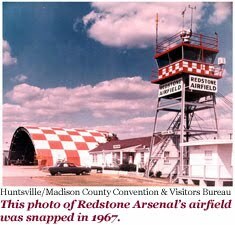 Redstone Arsenal, it came to be called. Move over, watercress. Enter assembly lines and military supply convoys. But at war’s end, with no active combat to support, Redstone virtually emptied. Troops and brass left town, women we called “Rosie the Riveter” — who had taken jobs in the munitions plant while their men fought abroad — went back to their homes, and “For Sale” signs ringed the arsenal’s perimeter. 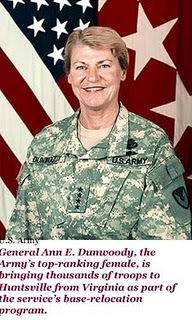 Powerful U.S. Senator John Sparkman — a Huntsvillian — scrambled to find a new Redstone occupant. He worked hard to land a promising Air Force wind-tunnel project but lost out to a town up in Tennessee. Things were looking grim for Madison County, Alabama, until the biggest surprise of all startled the entire South. 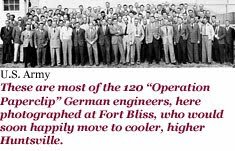 Three states away, at Fort Bliss in the hot, scrubby Texas desert near El Paso, and at the even hotter White Sands Proving Ground in nearby New Mexico, 120 German scientists and engineers led by Wernher von Braun were hard, but rather unhappily, at work. They had developed Nazi Germany’s deadly V-2 missiles, been captured by Allied forces, and recruited during “Operation Paperclip” by American agents to produce U.S. ballistic missiles. Bavarians mostly, the Germans longed for some lakes and hills and an occasional cool zephyr. And the U.S. Government was looking for a place to accommodate them. 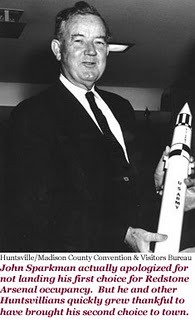 Huntsville’s nearly empty Redstone Arsenal would be chosen, not just to please the German engineers but also to move their rocketry near the Tennessee River, which provided a fine shipping channel for rocket components, eastward to waterways that led to the assembly and launch site at Cape Canaveral in Florida. 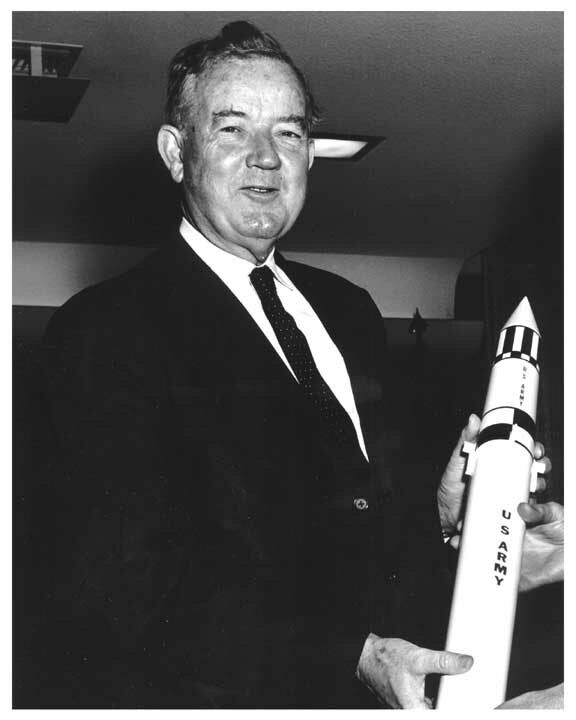 Ed Buckbee, who worked with von Braun and later became the first director of the Alabama Space Camp; Rocket Center — which I’ll describe in a tad — told me about the first trip of a 24-meter (80-foot)-long Saturn booster from Huntsville to the Cape in 1963. Things went smoothly until the enormous barge carrying the monster rocket arrived at a dam that had broken. Workers somehow lifted the rocket and carried it, portage style — though not on their shoulders — past the dam and back down to the river. Then the fun began! Buckbee and others escorting the rocket to Florida had to duck when backwoods yokels fired rifle shots at the passing booster. Admittedly, such a thing must have been a terrifying and tempting target. Back in Huntsville, change — and noise — were in the air. 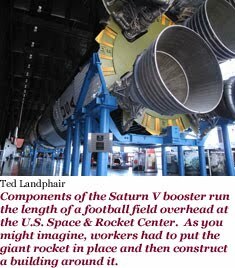 (Have you ever heard a Saturn rocket test fire or blast off?) Happy to be in high country, the Germans and their families assimilated eagerly and seamlessly, taking up residence on Panorama Drive near Monte Sano — though the “mount” was but 488 meters (1,600 feet) high — funding numerous cultural programs, and even starting an astronomical society with a planetarium that they opened to the public several times a month. 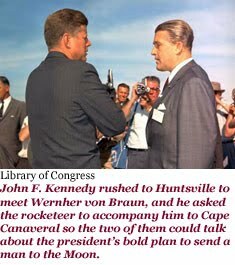 Then, in 1961, just after announcing the dramatic and ambitious goal of sending an American safely to the Moon by decade’s end, the nation’s new president, John F. Kennedy, made Marshall the destination of his first trip of out Washington. Since then, the Army’s own rocket research effort and a huge helicopter program have migrated to the military portion of the Redstone complex. 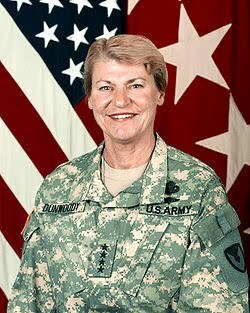 Just this year, the Army Materiel Command — including its commander, Ann E. Dunwoody, the U.S. Army’s first female four-star general — have begun a transfer to Huntsville from Fort Belvoir, Virginia, as part of the military’s base realignment program. That will mean almost 5,000 new military jobs and a similar number of contracting positions for burgeoning Madison County. 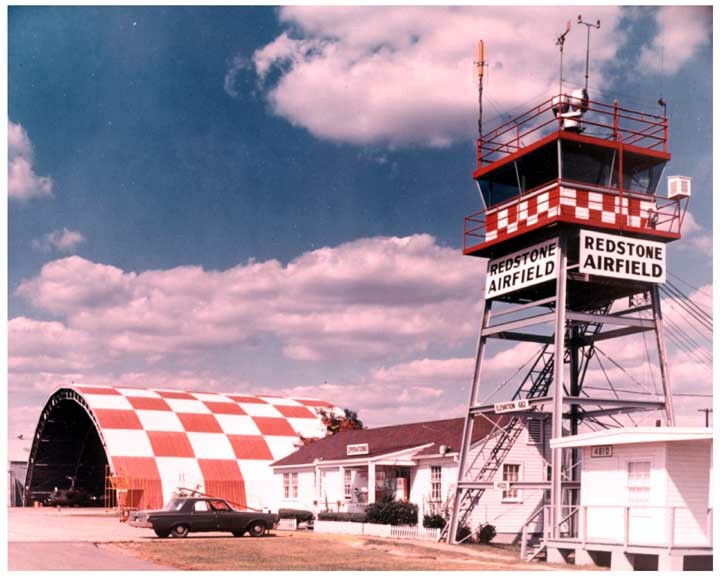 Redstone and the Marshall Flight Center are off-limits to most visitors, of course. 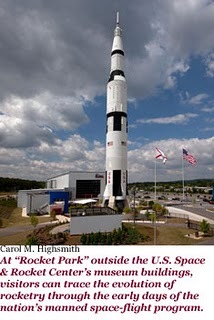 But those with a taste for space have plenty to awe them at the U.S. Space Camp; Rocket Center. Featuring more than 1,500 artifacts — including a NASA shuttle and an array of rockets outside and a gargantuan Saturn V rocket that looms overhead inside its exhibition hall — the center, funded almost entirely from admission receipts, has a colorful story and a mission that goes beyond showing off very, very big space toys. When Walt Disney decided to build a futuristic theme park in Orlando, Florida, in the mid-1960s, he and his design team visited von Braun, who had advised Disney filmmakers on three space-related movies. 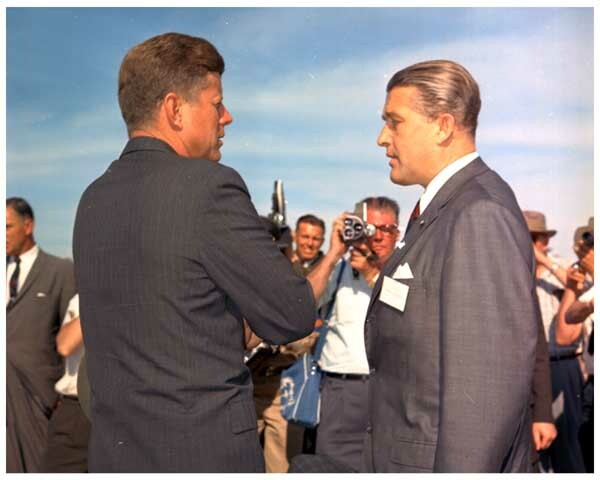 As he listened to the famed Hollywood animator’s plans for Disney World, von Braun came to realize the value of involving the public in the nation’s space adventure. 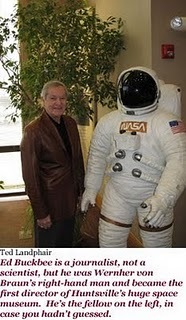 He found state land and NASA support for a decidedly hands-on space and rocket museum. And something else as well: “space camps” and “space academies” that would take children and teens — from 40 countries to date — into the world of an astronaut, including math and science instruction, flight-deck training, and even rocket-building. The camps began in 1982 with 471 participants. By 2007, total enrollment had passed half a million young people. Three women graduates of the program went on to become U.S. astronauts. Incubator research and biotech companies popped up in people’s garages and basements or moved to Huntsville, too, to the point that the city soon boasted the highest concentration of Inc. magazine top-500 companies in America. At Redstone Arsenal, the F.B.I. and U.S. Army located a joint Hazardous Devices School, at which civilian bomb squads — including the New York City outfit that dismantled the car bomb recently found in Times Square — are trained. Forbes magazine named Huntsville one of the 10 U.S. cities best poised for recovery from the long recession. “Initially we chose not to participate” in the economic downturn, joked county commission chairman Gillespie. Unemployment, once at a 2.3 percent rate that meant just about anyone who wanted a job could get one, has crept above 6 percent, but that’s far below the national average. Like neighboring Mississippi, Alabama is still working to overcome history’s black mark for its years as a slaveholding state and, later, bastion of racial segregation. “Back in the ’60s, ‘integration’ was a word, and that’s all,” Reeves told me. “We all remember 1963, with Governor [George] Wallace standing in the doorway at the University of Alabama,” symbolically blocking two black students from enrolling. “Well this wasn’t our way here in Huntsville. The very first college in the state to integrate was Alabama A&M, the historically black school. 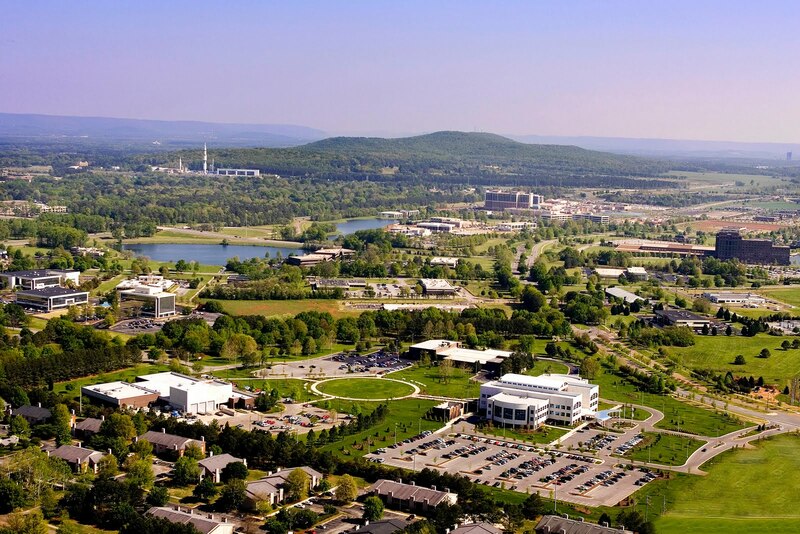 The [white] University of Alabama at Huntsville was second, a week later. No photographers. No police officers. A black graduate student walked in, enrolled, and went to class. Theophilus “Bull” Connor, Birmingham’s notorious police commissioner and staunch defender of racial segregation, employed fire hoses and attack dogs against protesters. Huntsville was the first settlement in what began as the Mississippi Territory, immediately west of Georgia. Genteel Georgia had been one of the original American colonies and states, but this was brambly wilderness. 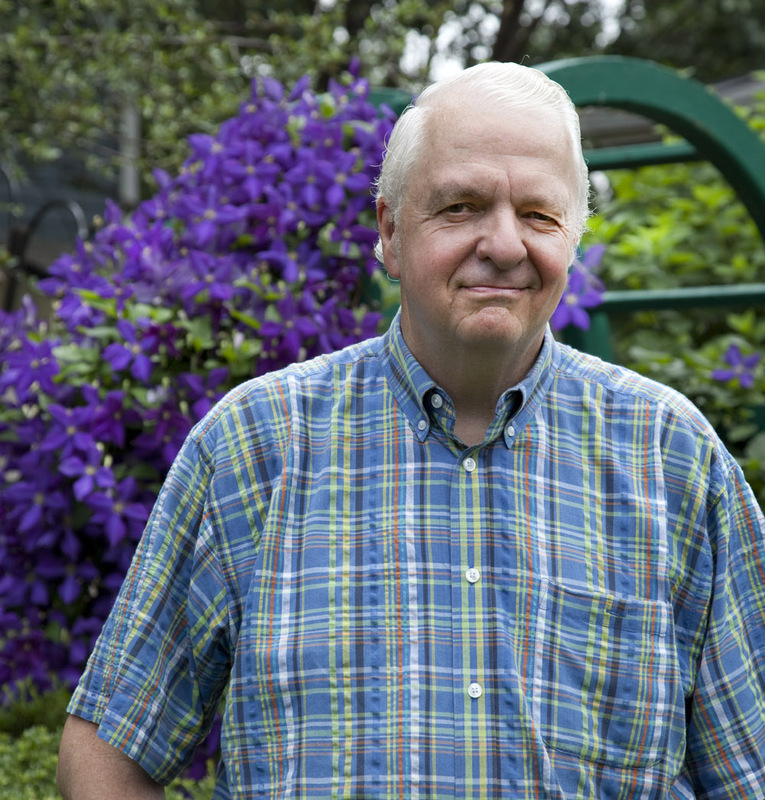 When the area was thrown open to settlement after the colonists’ triumph in the Revolutionary War, a war veteran and trapper named John Hunt built a cabin near a refreshing spring — now the centerpiece of Big Spring Park in downtown Huntsville. A more influential settler named the place “Twickenham” after the hometown of English poet Alexander Pope. Other frontiersmen found the name prissy, and when anti-British sentiments bubbled during the War of 1812 they insisted that it be renamed for their good friend Hunt. 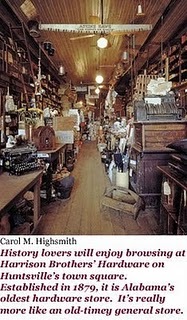 Huntsville was briefly Alabama’s first capital before state offices moved south to Cahawba, and then Montgomery. 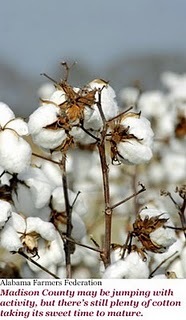 As the largest cotton producer in the Southeast, Madison County was assuredly slave country, and the marauding Union Army occupied it at the first opportunity in 1862 during the U.S. Civil War. They sacked plantations and sent their owners packing, but Huntsville was largely spared from Yankee depredation. 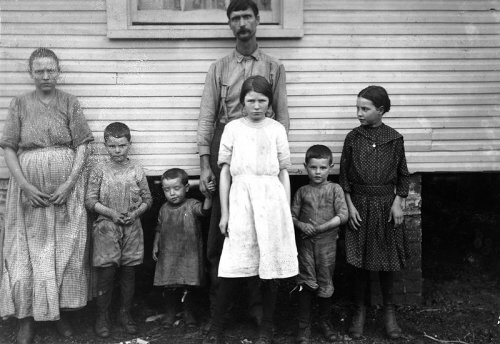 Madison County moseyed through the next few decades largely unnoticed, growing its cotton and watercress, and it looked to be heading toward relative oblivion when textile mill after mill closed in the teeth of the 1930s’ Great Depression. 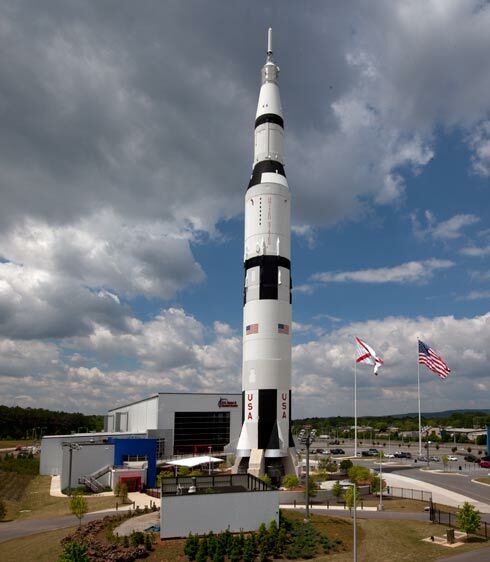 Then came the war, von Braun, and the implausible ascent of Huntsville, Alabama, into the forefront of high technology. You may have been wondering all this time what “watercress” is. It’s a leafy aquatic vegetable, prized as a salad accent and — especially by the British — as a sandwich fixin’. It’s also a main ingredient in the widely sold “V8” vegetable juice. Watercress grows in precisely the kind of cold, high-country springs that you’ll find in Northern Alabama. But watercress devotees need not plan a pilgrimage. Only one or two farms cultivate the plant in Madison County these days. Mosey. To amble along in no great hurry. >It was vary interecting ! Do more stories. >The story of the integration of Huntsville's schools has a twist often overlooked. The first integrated school was St. Joseph's Mission school, a Catholic school in a black neighborhood. It was integrated on September 3, 1963, after white families petitioned the diocese to be allowed to enroll their children in the previously all-black elementary school. Today the K-8 school is called Holy Family, and it is roughly half white and half minority (primarily African-American and African).